Dance as Yoga examines the background, technique and embodiment of classical Indian odissi dance while mapping a practice grounded in an understanding of yoga. It examines odissi's physicality using Choreological Studies, a discipline founded by Rudolf Laban for the study of movement and dance. 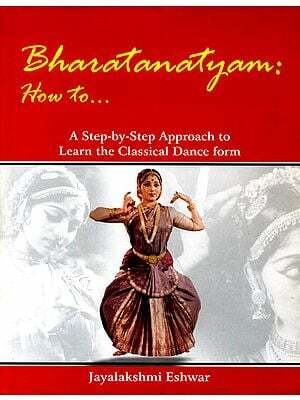 The material provides useful information for practising dancers, scholars and general readers, desiring an in-depth view of how Indian dance techniques function as sadhana. Dance as Yoga addresses the background, technique and embodiment of the odissi dance form. 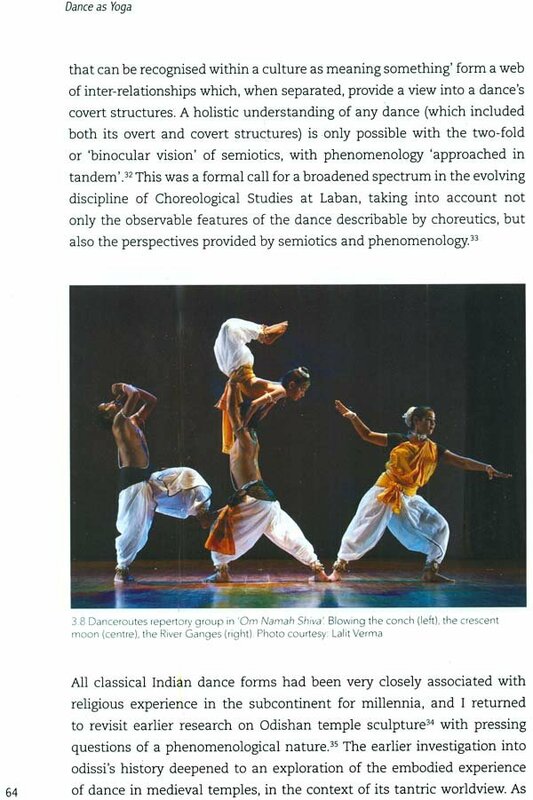 It describes cdissi's mechanism for creating, dispersing, and expressing energy, as well as some early experiments in choreography that extended its accepted parameters with reference to Choreological Studies. It is meant for both performers and audiences to better appreciate the reasons for the restraints inherent in such dance forms and, by doing so, have an informed appreciation of innovation that builds on traditional strengths. Rekha Tandon is a choreographer and researcher in odissi with an interdisciplinary background. She has a BA in Architecture from the School of Planning and Architecture in New Delhi, an MA in History of Art from the National Museum in New Delhi, and a PhD in Dance Studies from Laban, London. She is the Co- Founder and Artistic Director of Danceroutes, now working at Skandavan beside Auroville, in Tamil Nadu, India. Odissi dance can provide an alchemical space, where the two dimensions of matter and spirit have a means of dialogue. The tradition teaches that the ability to use it in this way is acquired through a guru's blessing and rigorous training. The effort required from the student is disciplined practice and a surrender of the ego. These values are questioned now, but the traditional odissi classroom in New Delhi, between 1978 and 1994 while I was a student, adhered to them, cocooned away from the fast changing social currents of urban cosmopolitan India. After years of such entrainment, there was a perception that if one strayed from what had been so diligently learnt, one would lose the magical ingredient of 'spiritual efficacy' that odissi offered. This deep seated conditioning, acquired alongside the process of learning technique, would overwrite my growing discomfort at always dancing to texts sung in languages that I did not think and feel in, and to musical structures that I wanted to change given odissi's unified sound-movement nexus. I also had limited ability to critique my practice or to play with odissi's symbols, forms, shapes, colours, and textures in space, a common outcome of rigorous training. Moving on from this conundrum became possible in 1994 through a scholarship to Laban in London, a contemporary dance school at the forefront of discourses in Choreological Studies. The dual engagement with both Western and Eastern knowledge systems allowed for understanding and articulating why all classical Indian dance techniques provided a means for psychological transcendence through movement. This reiterated the case for embodied experience to be recognised as a valid form of knowledge. It also proved, however, that traditional Indian dance practice could be greatly enriched by shedding its blinkered worldview and exploring perspectives provided by contemporary dance studies. After completing my PhD in 2005, I directed a research project with performing artistes living in the vicinity of Puri, Odisha, from the gotipua and other folk traditions, and subsequently ran a repertory company with such artistes for ten years. This sustained interaction with gurus and rural performers allowed for observation of how gestures, pneumonic patterns, and melodic phrases had been 'classicised' by Odisha's cultural revivalists. The process had been full of experimentation, trial and error, borrowing and assimilating ideas from all available resources. Following these early footsteps closely helped appreciate odissi's success as a syncretic construction of cultural raw materials available in the mid- 20th century. In retrospect, this was in marked contrast to how odissi had been transmitted to my generation in the 1980s and 90's as a finished product, with the subtext that it was an ancient legacy that needed to be kept as intact as possible. The phenomenon of transcendence through dance practice ran as a continuous thread in the discussions with traditional performers in Odisha. My interest in this central purpose of Indian dance had grown over two decades through intermittent interactions with Dr Kapila Vatsyayan, who positioned all such arts as forms of yogic sadhana. This had been reiterated by my dance gurus but without explication. Choreological perspectives allowed me to empathise with the working processes of different traditional choreographers and to appreciate the strengths and weaknesses of their practices, in achieving this end objective. Exploring the principles of yoga in Indian dance and building a tangible artistic practice based on this understanding is the focus of this present work. It describes an approach to expanding and relaxing odissi's traditional form, while still adhering to classical values. Furthermore, it presents the case that a shift in emphasis in classical dance training from choreographic compositions, to internalising fundamental movement and philosophical premises of both yoga and tantra, can enrich odissi in the 21st century. These knowledge systems form the bedrock of all Indian temple dance forms, and in them lies the strengths of such artistic traditions. In the light of this, contentions that odissi would be compromised if its choreography embraced other languages, musical structures, themes, and costumes, seem superficial. In any case, odissi's identification with the best of Odishan culture is far too well established already for such concerns to remain on centre stage. Dance as Yoga addresses the background, technique and embodiment of the odissi dance form. It describes odissi's mechanism for creating, dispersing, and expressing energy, as well as some early experiments in choreography that extended its accepted parametres with reference to Choreological Studies. It is meant for both performers and audiences to better appreciate the reasons for the restraints inherent in such dance forms and, by doing so, have an informed appreciation of innovation that builds on traditional strengths. 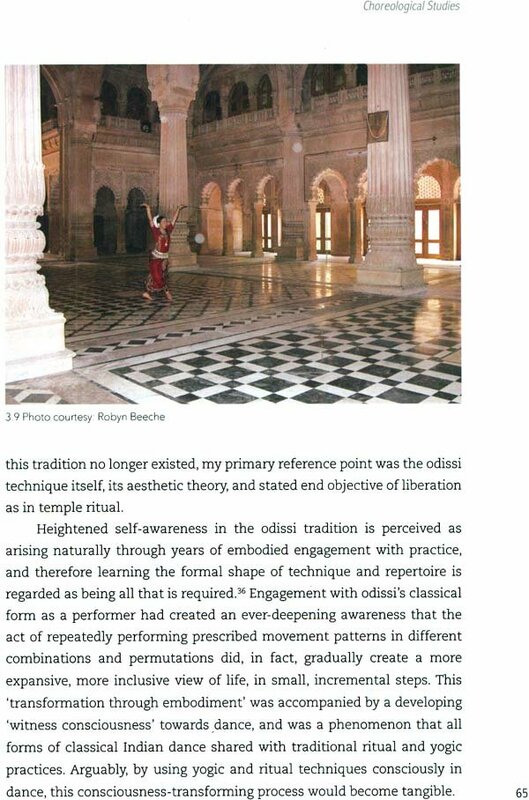 Perspectives on dance and movement introduced by Rudolf Laban, and subsequently added to by Valerie Preston-Dunlop and Ana Sanchez-Colberg, have been used in the view of odissi presented here. Though a discourse on somatics had begun in Dance Studies at Laban,' the natural reference point for many conventions of odissi's practice remained my personal involvement in yoga and its expression in the Indian arts as described by Kapila Vatsyayan. The specific area of enquiry has been what Phillip Zarrilli has described as the 'energetics' of performance (Zarrilli 2009, 1). He had stated that traditional Indian dance and martial arts are all psychophysical in nature." designed to concentrate the mind, relax the body, and build a performative presence through engagement with skill-intensive practices that are yogic in nature. Traditional odissi training was imparted without any space or scope for reflection on its psychophysical qualities. Hatha yoga had, however, articulated a course to be followed towards transcendence of mind by working on the physical body, based on an understanding of its vital energy, or life force. Yoga therefore became the obvious starting place for investigating this aspect of odissi. Research in the parallel Indian dance forms of bharatnatyam and kathak contributed to the understanding of odissi's place in the cultural landscape of 20th-century India. Seminal studies on the socio-political history of bharatnatyam by Amrit Srinivasan (1985), Avanti Medurai (1996), Allen Mathew Harp (1997), Janet O'Shea (2007) and studies on kathak by Pallabi Chakravorty (2008) were useful in recognising the shared trajectories in the reconstruction, social acceptance, and economic viability of the modem incarnations of classical Indian dance. Uttara Asha Coorlawala's writings helped better understand the frustration experienced by Indian dancers when confronting the seeming divide between Eastern dance practice and contemporary dance thinking. Anurima Banerji (2009) provided an overview of scholarship available on odissi dance. Work documenting the life histories of odissi's founding gurus by Illiana Citaristi (2001), Ratna Roy (2009), Sunil Kothari (1990), and a self-history published by Priyambada Hejmadi (2008) provided useful information about odissi's founding gurus and the influences on their lives. Dinanath Pathy (2007) supplemented this with his observations on the roles played by different personalities in the development of this 20th-century tradition. 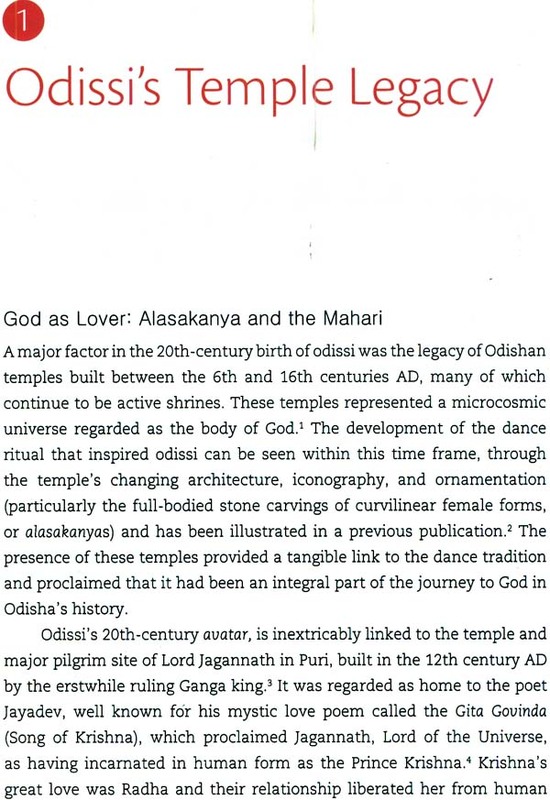 The first and second chapters provide an account of odissi's temple resources in architecture, sculpture, and the mahari and gotipua traditions, which fed into the creation of odissi. These historical facts were discussed in interviews conducted during Danceroutes' Raghurajpur Lila Project" with several individuals closely associated with efforts on the ground to make the first 'classical' compositions for odissi. They explained how the mahari and gotipua traditions transferred indigenous melodies, rhythms, and movement patterns to odissi, creating the mangalacharan, pallavi, abhinaya choreographic templates, 'bringing life' to the languorous maidens as imaged from medieval temple sculpture. Also discussed is the formation of styles and sub-styles through individual ways of embodiment in odissi. 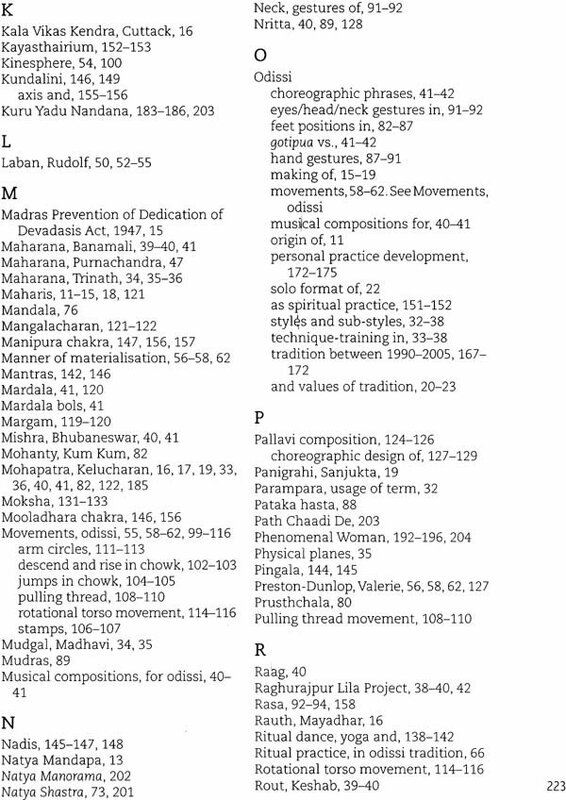 Most classical Indian dancers trained within India are unfamiliar with Choreological Studies and Chapter Three has been included to familiarise such readers with its approach. 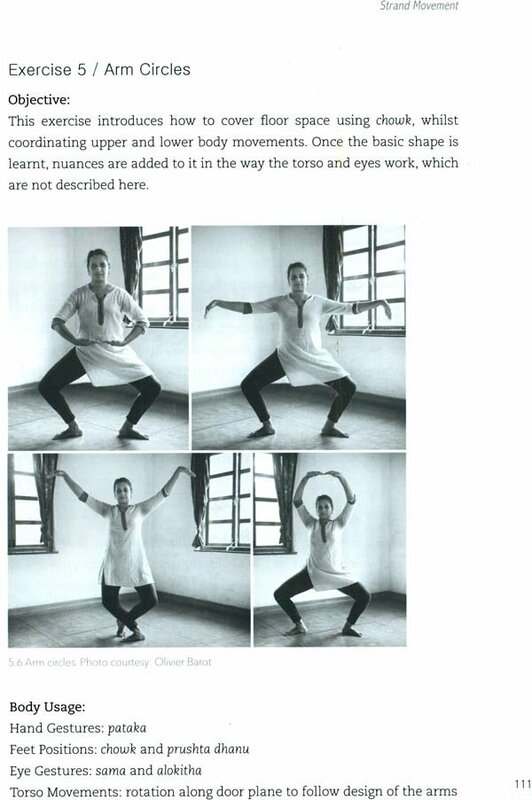 It introduces tools for movement analysis that were important for a critical understanding of odissi's practice. A perspective on rasa in nritta based on the idea of the 'choreutic unit' is presented. 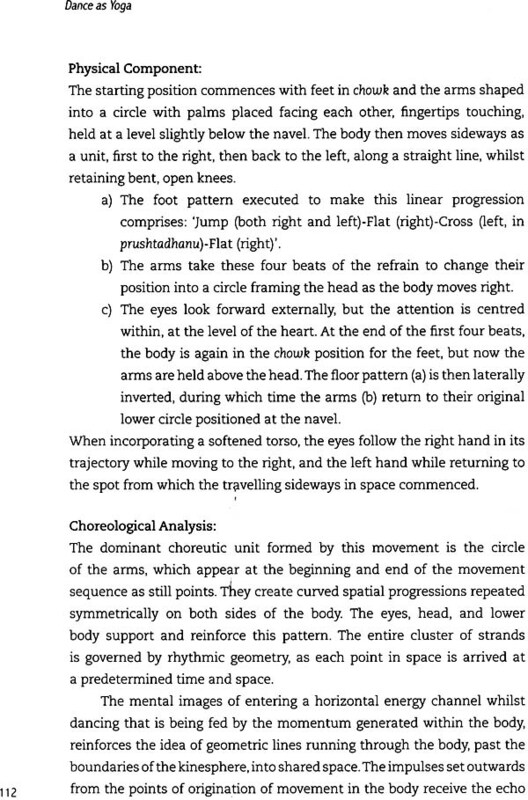 Chapter Four utilises these ideas to examine technique and the articulation of movement, referring to the vocabulary of different body parts as enumerated in the Abhinayadarpanam, a commonly used reference text for Indian dance. It focuses on the strands of Body and Space, presenting the view that odissi's features assist the dancer in using dance as a means of self-transformation, if that is made a conscious intention. 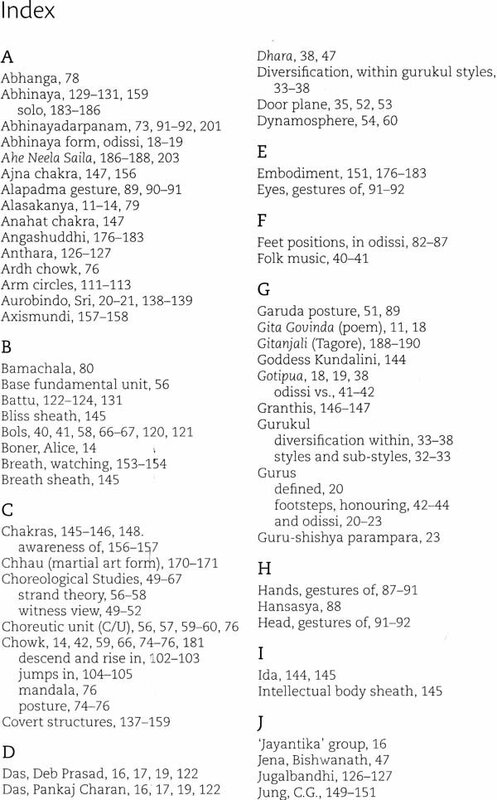 Chapter Five follows with a description of six common dance exercises in the odissi tradition, with suggestions on their practice incorporating imagery drawn from yogic techniques for self-awareness. These images allow odissi movement to be internalised with greater facility and ownership. Chapter Six examines the different choreographic forms that were created for odissi. It underlines the critical and defining nexus between sound and movement in classical Indian dance. Deconstructing this relationship demonstrates that sound is privileged over movement and greatly determines the movement possibilities available to the traditional dancer. Understanding the resources and methods used to create repertory compositions and working with these afresh 1S essential for earning ownership of tradition. Chapter Seven lays the ground for engaging with odissi as an 'integrated body-mind space' by investigating its covert structures and their embodiment in movement. It explores the difference between dance as sadhana and upasana along with the role of a witness-self overseeing mundane thought, as recommended by the yogic tradition." 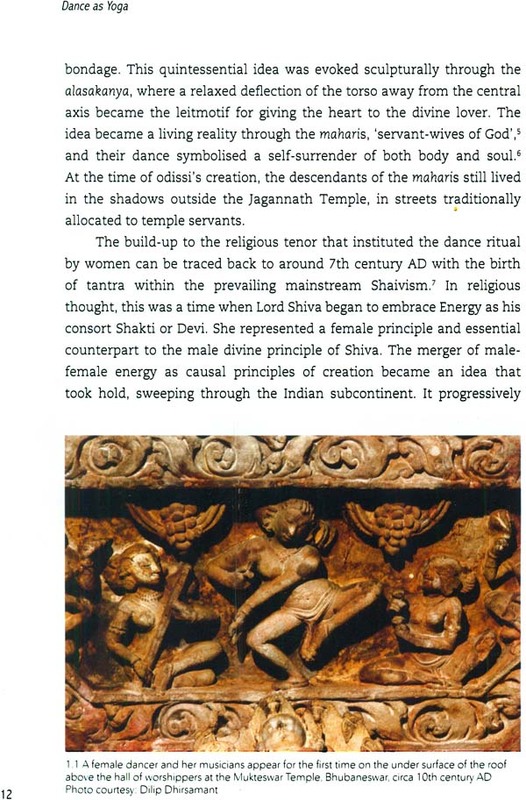 The psychological experience of ritual dance as part of tantric worship in medieval Odisha is also discussed. The rationale explored is that by grounding movement in established meditative techniques from yoga and tantra, odissi's physical parametres can be freely expanded, remaining in intrinsic harmony with its cultural and spiritual legacy. In fact by doing this, odissi dance opens itself to a considerably wider engagement with 21st-century life. The concluding chapter is a reflection on the external environment of the odissi tradition in Bhubaneswar and New Delhi between 1990 and 2005, reviewing key events that directly shaped the yogic approach to dance presented here. Choreographic pieces created by the author, which represent experiments in embodiment, ownership, and co-authorship of choreography, and which separate movement from its defining nexus with sound, are described. All these examples explored the underlying presence of a 'tantric body map' in different ways and were performed by the Danceroutes repertory company over several years.